At a recent Chaplain Spouse Coffee, we played a game where we were to write down 3 facts about ourselves and then others would have to try and guess who we were based on those facts. We learned some fun and interesting things about one another, I must say! One of the facts I wrote down about myself is that I am a water snob. It’s sad, but true. I am super-picky about the “taste” of the water I drink. My husband makes fun of me for it, since he really doesn’t think water has any taste anyway. Seriously though, I drink bottled water even at home because I can’t stand the taste of our tap water. I always get lemon in my water at restaurants because I usually hate the taste of their water. I am a water snob. Notice it doesn’t say “access to good-tasting water.” It says clean water. That means water which is safe to drink and doesn’t cause illness or disease or death. Oh my. Today is World Water Day 2015, and one of my favorite organizations, Samaritan’s Purse (the ministry that also runs Operation Heal Our Patriots) is dedicated to raising awareness for and making a dent in the world’s water crisis. They have a wonderful site that explains more facts and what they are doing. In case you don’t have time to go look right now, here’s just one of the multiple ways they are helping around the world right now. 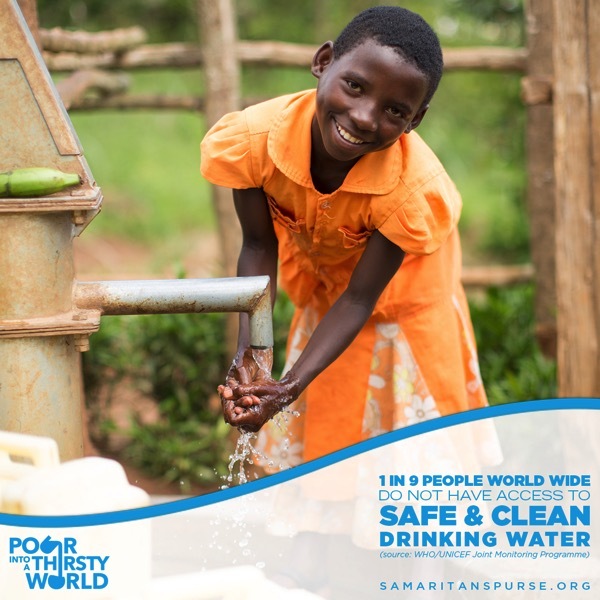 Samaritan’s Purse works with communities to install and rehabilitate hand-dug wells and boreholes. After a project is completed, we offer maintenance training to community members who will assume responsibility for upkeep. 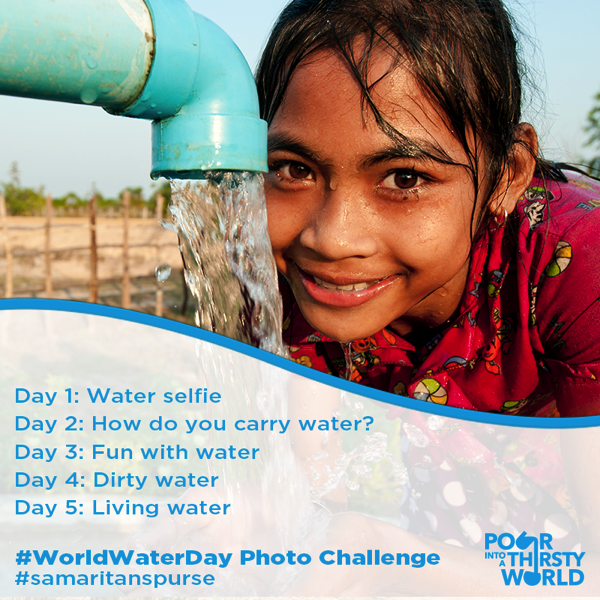 One of the ways Samaritan’s Purse is seeking to raise awareness and highlight World Water Day 2015 is by having an Instagram Challenge! The challenge starts today and runs for 5 days. We’d love to have you play along! Be sure to tag your photos with #WorldWaterDay and #SamaritansPurse. And if you want to support Samaritan’s Purse efforts to provide clean and safe water around the world, please visit their Water, Sanitation, and Hygiene page to learn more. The next time I’m thirsty and reach for my clean, fresh-tasting, and completely safe bottle of water (because, truthfully, I’m probably not going to suddenly be ok with my tap water) I will remember those who do not have safe water to drink and I will be motivated to pray for and act to support organizations like Samaritan’s Purse that are seeking to make a difference. Thanks so much for sharing about Samaritan’s Purse for World Water Day! We really appreciate all your support! Sarah, it’s my privilege! Thank you for giving me the chance!